Alternating chapters center on four different players on the two teams that meet in a semi-final game of the NCAA Final Four Tournament. Two eighth grade students win the opportunity to cover the NCAA Final Four first hand as journalists, but while reporting live at the tournament they uncover a scandal that involves blackmail. Drew is a senior living in Harlem and has dreams of making it in the NBA, but he has to learn to control his anger issues first. Two basketball teammates, one black and one white, form a connection through tutoring and find that they have a lot more in common than they had first thought. 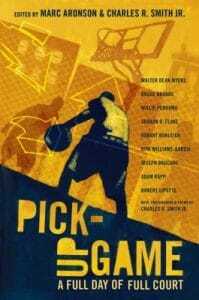 This collection of short stories focuses on different perspectives of one pick up game played on a hot day in July in New York City. This manga series centers on Kyo, whose father is determined to live out his NBA dreams through his daughter. Her father signs her up for the boy’s basketball team and Kyo masquerades as a boy on the team to make her father happy. Andy Johnson’s son, Mark Johnson, tells his father’s story of how Andy became one of the original Harlem Globetrotters. This is a collection of high res photos of some of the more unique NBA tattoos and the first hand stories by the players about why they got them. Larry Bird and Magic Johnson are famous for one of the most well known basketball games in history: the 1979 NCAA Championship game between the Michigan State Spartans and the Indiana State Sycamores. Davis retells the events that led up to the famous game. Lance Allred is the NBA’s first deaf player. In this memoir he tells his story of growing up in a fundamentalist Mormon household, realizing his dream of being in the NBA, and how hard it was to get there. This book includes a history of every NCAA tournament from 1930 to present and provides an analysis of the top 100 games played in the tournament.